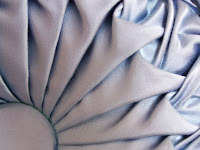 Fabric manipulation and embellishment techniques are methods of folding, shirring, pleating, and gathering fabric to make artistic shapes in an otherwise flat piece of material. So many of the old sewing crafts, such as fabric manipulation, are in danger of becoming lost arts. Too many people these days would rather purchase their home décor and clothes instead of making them. That is a true shame. Fabric embellishment techniques have a rich and varied history. 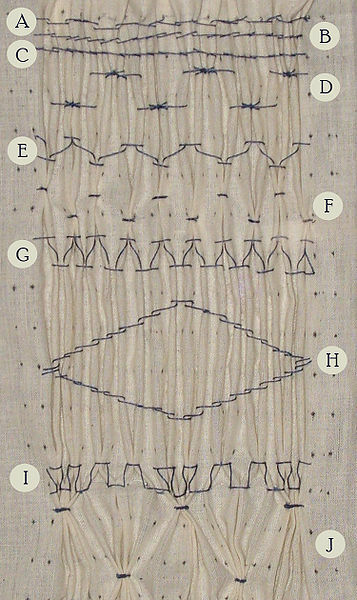 Sometimes the same technique will have several different names, but regardless what the techniques are called, they are methods of folding, shirring, pleating, and gathering fabric to make artistic shapes in an otherwise flat piece of material. In many ways, fabric manipulation is similar to the paper manipulation accomplished in origami. Original work designed and made by Durova. The basic of all these techniques is gathering, either by hand or by machine. Some machines come equipped with gathering feet or attachments, but even a very basic machine can be used to gather by using a basting stitch (10 or more stitches per inch) and then hand sliding the fabric over the thread to make the gathers. 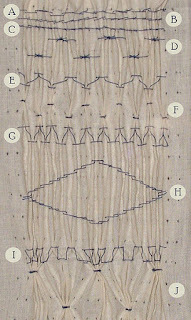 The smocking techniques gather fabric according to a pattern, usually printed or drawn on the back of the material. Fabrics used in this art form are as wide-ranging as the people who use them. Cotton, cotton-blends, wool, polyester, silk, and satin can all be used to beautiful effect. 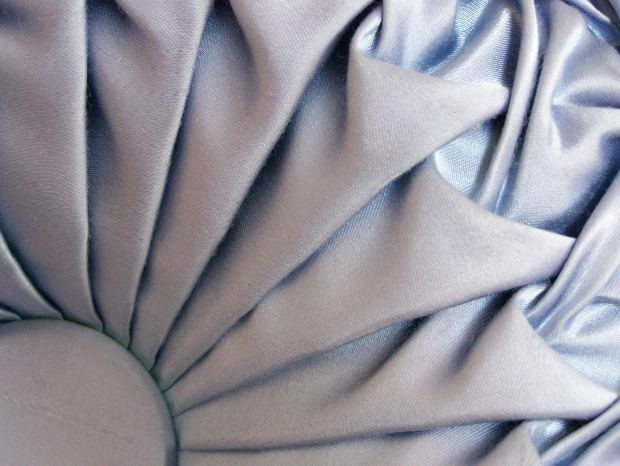 Did you ever wonder how to make 3-D, manipulated fabric pillows, shirred blouses, or the perfect pleats? The answer you have been looking for is The Art of Manipulating Fabric by Colette Wolff. For someone who loves to sew, this book is a treasure. While there are no project patterns, anyone with a little imagination can take the instructions for gathering, flouncing, pleating, smocking, tucking, cording, quilting, and applique-ing, add a flat piece of cloth, a needle, thread and some time, and come up with something amazing. I love this book. I could spend hours perusing the pages. The diagrams and pictures make it easy to follow the directions. Some techniques are best accomplished with a needle and thread, while others can be easily done with the machine--if you have the instructions, that is! This book is highly recommended for the library of all sewing enthusiasts! I loved visiting the older ladies in my home town when I was a child, because they almost always had a collection of hand-crafted, smocked pillows in their living rooms and adorning their beds. I would sit for hours trying to figure out how a pattern was created, but since I couldn't take pillows apart to see the underside, I never did figure it out. When I found The Art of Manipulating Fabric at my local bookstore, I was ecstatic. Now, I will be able to make beautiful decorative pillows for my own home--as soon as I finish reading it! The book is well written, with dozens and dozens of detailed illustrations and photographs to show not only how to do it, but what it should look like when you are done. Every time I think I have a pattern chosen for my pillow project, I turn the page and find another pattern I want to try. The book is not a project book, meaning there are no specific applications of the fabric embellishment techniques. Rather is it an encyclopedia of fabric manipulation techniques. You add them to your own patterns. In the foreword to this book, the series editor, Robbie Fanning, wrote, "A seminal book like this one comes along only once or twice in an editor's lifetime." After looking through the book, reviewing all the images, and starting to read the contents, I have to agree that this is the seminal work on fabric manipulation! For more articles on sewing, visit Sewing Along with Linda.